UNITED STATES: The governor of Maryland has revealed a package of environmental measures including funding for the renewables sector, but faces criticism from the green lobby over his veto for 2016's clean jobs bill. In a new $65-million package, Republican governor Larry Hogan has set aside $41 million to be invested in renewable-energy projects through Maryland's strategic energy investment fund. The state government said the fund's purpose is to "decrease energy demand and increase energy supply to promote affordable, reliable and clean energy to fuel Maryland's future prosperity". A total of $3 million will be invested in a programme designed to support and train 1,500 workers for jobs in the wind, solar and hydroelectric sectors, Hogan's office said. It would be Maryland's first direct investment in green jobs training. An additional $7.5 million will be used to create the Green Energy Institute, a partnership between the University of Maryland Energy Research Centre and the Maryland Clean Energy Centre to develop clean-energy innovations and attract private investment. The package also includes tax credits for electric vehicles and benefits to improve water quality on the state's coastline. "Making it easier and more affordable to invest in alternative energy is essential to move Maryland toward a cleaner energy future," said Mary Beth Tung, director of the Maryland Energy Administration. However, Hogan is taking some criticism from the renewable energy lobby, including the American Wind Energy Association (AWEA), which is supporting calls to override his veto of Maryland's Clean Jobs Act. The bill would also have increased the state's renewable portfolio standard (RPS) to 25% from the current 20%. 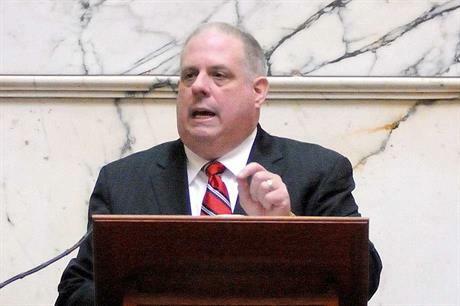 Hogan vetoed the act in May 2016, claiming it was a tax on the consumer. However, Maryland's legislators passed the bill with a big-enough margin to give them the option to override the veto. In a letter to the legislature when vetoing the bill, Hogan wrote: "This legislation is a tax increase that will be levied upon every single electricity ratepayer in Maryland and, for that reason alone, I cannot allow it to become law. (The bill) will impose a tax increase of $49-196 million by 2020 in order to fund the proposed increase in the state's (RPS) compliance." The green lobby believes the state should accommodate both the new environmental package and the clean jobs bill, calling for the lawmakers to override Hogan's veto. "We are encouraged by governor Hogan's intention to promote economic growth and environmental quality as he outlined ... in his 2017 agenda," said AWEA chief executive Tom Kiernan. "The Clean Energy Jobs Act is the most effective way for him to meet those goals, creating new jobs in wind power and other industries while attracting hundreds of millions of dollars in new private investment to Maryland. We strongly support a veto override. It will signal Maryland means business and is committed to job growth while strengthening the state's energy supply," Kiernan added. AWEA pointed out Maryland risked losing out on jobs and investment if the veto was allowed to stand. "States representing roughly a quarter of the US population (such as California, Oregon and New York) have chosen to raise their renewable energy goals over the past year while adding jobs and investment," AWEA added. According to Windpower Intelligence data, at the end of 2016, Maryland had 190MW of installed wind capacity. In November, two developers put forward plans for offshore wind sites.